I was kindof excited about how these turned out. Yesterday when I was glazing and feeling sorry for myself I decided to play around with the bowls that were trimmed but too dry to pierce. 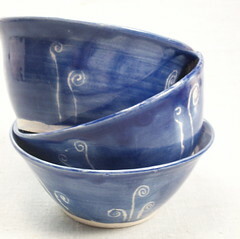 I painted fiddleheads with clear glaze around the base of the bowl in clusters then waxed them. I used my favorite cobalt blue glossy glaze over the top. I also made fiddleheads radiating from the center of the inside of the bowl, but they didn't do so well. This glaze is pretty runny and even the biggest wax application couldn't stop the blue. There's another bowl upstairs that's dried up and I might fire with the next batch of berry bowls to glaze this way. I don't really need any other bowls (we use the cafe au lait bowls almost exclusively), so these might go into the gift closet.